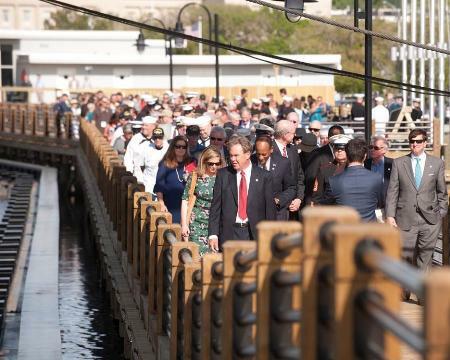 Battleship NORTH CAROLINA dedicated the SECU Memorial Walkway in Wilmington recently. The SECU Foundation donated $3 million towards the construction of the Memorial Walkway. Over 250 guests joined SECU President Mike Lord and former Foundation Chairman Jim Barber. North Carolina Secretary of Military and Veterans Affairs Larry Hall addressed the crowd and recognized SECU for their gift to our veterans. The event received excellent state-wide media coverage.